For the 3rd post in this series with T.J. Maxx, we are talking about another trend that is HUGE for Spring 2013 – black & white! These contrasting shades were seen all over the runways in everything from bold stripes, mixed prints & sleek separates. 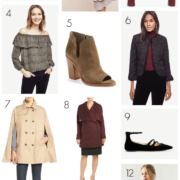 It happens to be one of my favorite trends for the season (as evidenced by this post), so I was thrilled to put together an outfit with pieces I found at my local store. This time I decided to go for a sophisticated look that would work both in & out of the office. I’ve long been a fan of peplum and this top is the perfect light & airy option for those warmer days when you still want to look polished. And every girl should have a pair of black slim cropped trousers in her closet – easy to dress up or down & ideal for showing off your favorite pair of heels! I wanted to add in some metallic accessories to finish off the look & couldn’t believe my eyes when I found this gorgeous necklace for less than $30!! 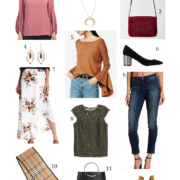 It bears an uncanny resemblance to a designer piece that I had been eyeing, but never could have afforded…just one of the many reasons why I love shopping at T.J. Maxx (the deals are insane)! 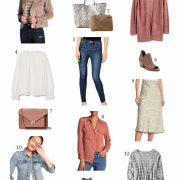 You can still submit your own T.J. Maxx Style Scout looks for a chance to win up to a $500 gift card – click here to read the official rules & find out how to enter!! looking gorgeous as usual in this! love the pretty lacy peplum! Oh I love everything about this feminine outfit! Perfectly styled with fabulous accessories too. Beautiful outfit and styling. This outfit is on trend and so flattering on. If you get a sec, check out my latest post 'stripes galore'. That necklace under $30? Amazing! Way to find such classic pieces, including those heels, which will work with everything. Love that lace peplum…perfect way to wear black and white! So pretty. Love the lace peplum! Loving this look from head to toe. So jealous you found that killer necklace at Tj Maxx! Gorgeous look! I am loving your black and white look. I love how much you love peplum tops. You may have been the first blogger I saw rocking that trend! I love that lace peplum, it's gorgeous! This little white peplum is so cute!! It will be the perfect summer piece. And you and I are thinking the same way… I have a post coming up next friday wearing black and white with a little bit of gold in my sandals (which is different from what I normally do). I like the way it looks! I love this look.. totally something I would wear too! Peplums look so good on you! Love all the gold accessories too! The metallic details are perfect with the black+ white outfit. Such great heels! I'm loving black and white too. The peplum is perfect on you!! OK that necklace?!? Amazing!! Can't believe you found it there, I never find any amazing jewels when I go! I am totally jealous of that necklace find – it is stunning! I love the lace peplum! I have one just like it in teal that I can't wait to wear again (if it would ever warm up!) Very pretty and sophisticated! Completely adore the necklace. Gorgeous! You are so right about the slim cut cropped black pants – I'm still on the hunt for some! I need something a little more tapered than what you have I think because I'm shorter – yours look great on you, though! LOVE the lace peplum and those metallic sandals! wow..what a chic, structured, fab look!! You can do no fashion wrong!! SO pretty! I've always been overwhelmed by TJ Maxx, but this is such a beautiful top I want to go right now! Loving this peplum lace top, you have such a great figure, it just flatters you so well. The heels are super chic too. love the heels and clutch! absolutely love this top! so chic! That lace peplum top is gorgeous! Love the whole look ~ so pretty and romantic. And that necklace looks like a Lulu Frost! Where can I buy the shoes. I love them.